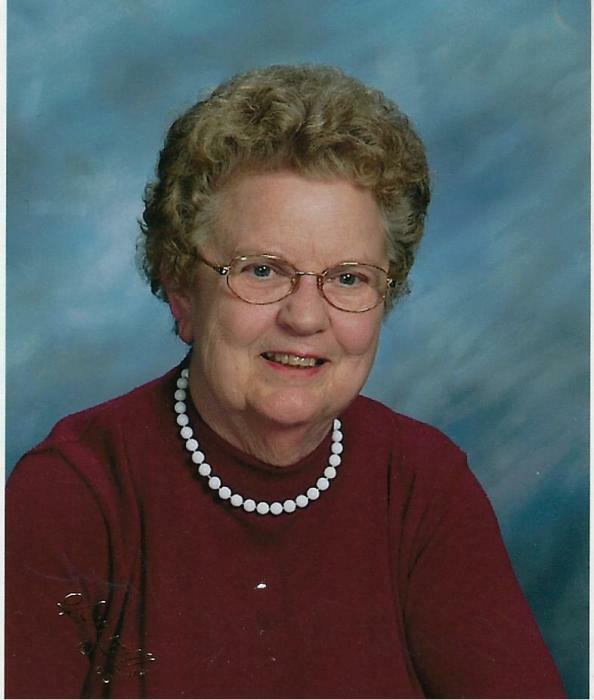 Veryl Mary Voss, age 93, of Guttenberg, IA, died Friday, March 15, 2019, at the Guttenberg Care Center. Veryl was born on May 15, 1925 in rural Petersburg IA, the oldest child of John and Irene (Koelker) Dingbaum. Veryl grew up in Petersburg and attended school there. Veryl was united in marriage to Anthony J. Voss on June 13, 1944 at St. Peter and Paul Catholic Church in Petersburg. The couple farmed near Guttenberg. Anthony preceded her in death on June 2, 1992. Veryl was a hardworking wife and mother all of her adult life. As a member of the St. Mary’s Catholic Church in Guttenberg, Veryl enjoyed volunteering in the school library and lunch programs for many years. She was a member of the Happy Homemakers Club and the St. Mary’s Quilters. Later she was a Red Hat Lady. Veryl enjoyed baking, gardening, oil painting, reading, crafts and quilting. She especially loved her times traveling in the United States and Canada with her husband Tony. She also enjoyed history and family genealogy. Veryl is survived by two sons, Steve (Joyce) Voss of Guttenberg and Alan (JoAnn) Voss of Guttenberg; a daughter Jane (John) Berns of Dubuque; daughter in law, Jean Voss of Guttenberg; 9 grandchildren, Chris, Ryan, Ben, Kara, Zach, Doug, Laura, Bryant and Timothy; 14 great grandchildren; brother, Lester Dingbaum of Manchester; sister, Rita (John) Garside of Dubuque; sister in law, Eileen Dingbaum of Dyersville and many nieces, nephews, relatives and friends. Veryl was preceded in death by her parents; husband Anthony; son Keith; 2 grandchildren, Brian and Jennifer; brother Alver Dingbaum; 3 sisters and brothers in law, Therese (Bill) Gibbs; Julie (Leo) Gerken, Dorothy (Merlin) Maiers and a sister in law, Virgie Dingbaum. Veryl’s family would like to thank the staff at the Guttenberg Care Center, Guttenberg Hospital and St. Croix Hospice for their excellent and compassionate care.